Love this side dish for its color and taste -- but try it for its technique, one that will work just as well for other vegetables. It starts off with thin-sliced carrots in nothing more than water, salt and pepper beneath a cover of oil- or butter-coated parchment. Parchment! Of course -- it's the same principle as a covered skillet but really concentrates the heat and the moisture right there. I couldn't believe how quickly the carrots cooked! Don't start cooking, however, til the vegetables are prepped. The carrots and pepper slice up in no time but the sugar snap peas take a bit. These weren't stringy so I didn't bother to remove the 'string', just trimmed the ends and cut into pieces. NEXT TIME The inspiring recipe said to "halve the peas lengthwise diagonally". Hmm. What does this mean? I decided that it meant to just cut the peas into bite-size pieces on the diagonal. But they were pretty fat so next time I think I'd cook the carrots first (because they hold their heat) and set aside, then use the parchment to separately cook the sugar snaps by themselves, then add the carrots back in along with the peppers to finish. 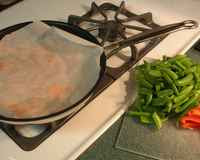 FROM THE ARCHIVES My favorite way to cook sugar snap peas is the Sugar Snap Peas with Lemon Butter, in the Recipe Box. A YEAR AGO Gypsy Pot from the Traveler's Lunchbox in Scotland! Prep the vegetables. Add the water, carrots and salt and pepper to a large skillet on MEDIUM HIGH. Rub olive oil onto parchment and oil-side down, press onto carrots. Let cook til crisp tender. 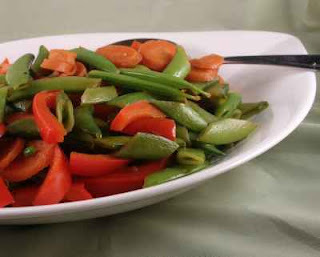 Remove the parchment (and the carrots of you're cooking the sugar snaps separately so not to overcook the carrots) and add the sugar snap peas and peppers. (Hmm. You might also cover with the parchment again. This might help the cooking time.) When liquid is nearly gone and sugar snaps nearly cooked, add the juice, sugar and seasoning and stir to coat. Increase the temperature to create a syrupy glaze (I'm always disappointed in this, I think it might take a stove with more BTUs than most home stovetops). Season to taste. What a great trick with the parchment! I was quite taken by the technique, yes, Joe. And I didn't even come from parchment makers! That's an unusual combination I would never have thought of. Thank you! We get so used to the same veggie/flavor combos, we forget it's okay to mix it up! (at least I do!). I like to toss in green olives and artichoke hearts to my eggs. Another slightly off beat taste combo: lox, cream cheese, and pinenuts in sweet peppers or bell peppers. Vegs' can leave out the lox.